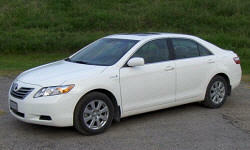 Toyota Camry Feature Availability Pros and Cons | Page 1 of 1 | Why Not This Car? The one thing I do like the bluetooth -- works great with my phone. Back-up Camera, Blind Spot Monitor, and Rear Cross Traffic Alert are fantastic. The side mirrors are small, need BSM option or a small convex mirror installed. Auto lights don't come on w/wipers (but DRLs always on). Carpet real thin for a deluxe XLE, no floor mats in pkg (but competitors don't supply them either). The equipment level is much better than non Hybrid Camrys. Radio is awesome and bluetooth works well. Keyless entry and start button is much more convenient than I had anticipated. High end model comes with many extras which make it more of a semi-luxury experience. VSA with TRAC - have to pay more. 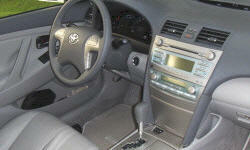 VCM feature is not there on Camry V6. Remote Window Control - not available on Camry. Camry offers every option imaginable. there are too many to list. My particular model has almost all of the options. The only options I do not have is the back-up camera and power rear view mirror. It was a major reason for the purchase. No other car offers navigation for the same price. Features in LE model meet most desired in a top level car.